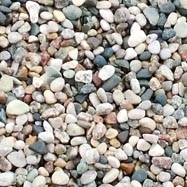 Fairy Rock - miniature river rock - adds a great paver base to stepping stones and patio pavers for your Fairy Garden Store miniature garden. 10oz sized container. Can also be used as a paver by itself or to add a desert look to your garden!